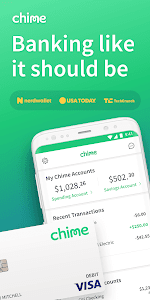 Chime is one of the fastest-growing bank accounts in the U.S. Stop paying unnecessary bank fees, get your paycheck 2 days early* with direct deposit, save money automatically, and manage your finances from anywhere using the Chime mobile banking app. When you bank with Chime, you get a Visa® Debit Card, a Spending Account, and an optional Savings Account to help you save money. Signing up is free and takes less than 2 minutes. Welcome to a better way to bank. With the Chime mobile banking app, you can stay in control of your money. 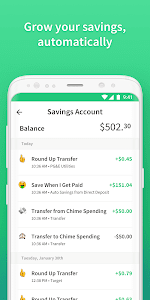 Track your spending, link your other bank accounts, and save money. • Step 1: Open Your Account: Download the app and sign up. Once approved, we’ll send you your Chime card within two weeks! • Step 2: Fund Your Account: Set up direct deposit with your employer to have funds deposited to your Chime account every payday. 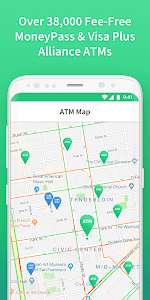 You can also connect other bank accounts and transfer funds from your existing bank account. 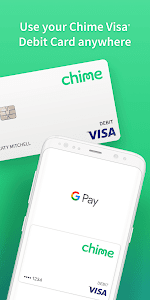 • Step 3: Update Bill Payments: Activate your card when it arrives, add it to Google Pay or Samsung Pay, and then set up recurring bill payments with your Chime card number or with your Chime account and routing numbers. 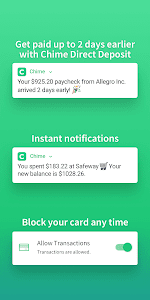 Opening a Chime bank account won’t impact your credit score. 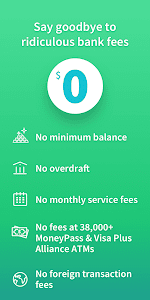 For more information please visit www.chimebank.com. 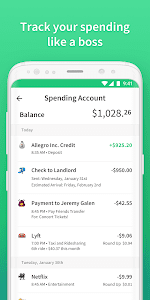 • Account Statements can now be downloaded and shared ? 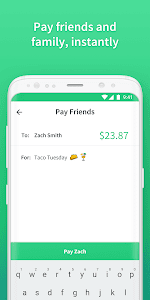 • Improved scrolling for Pay Friends contact list ? • Clearer error messages when internet connection is unstable ? • Plus lots of other small bug fixes ? 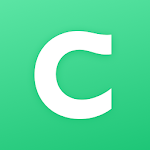 Similar to "Chime - Mobile Banking"